Sister, don't give up the land. They are not making land anymore. 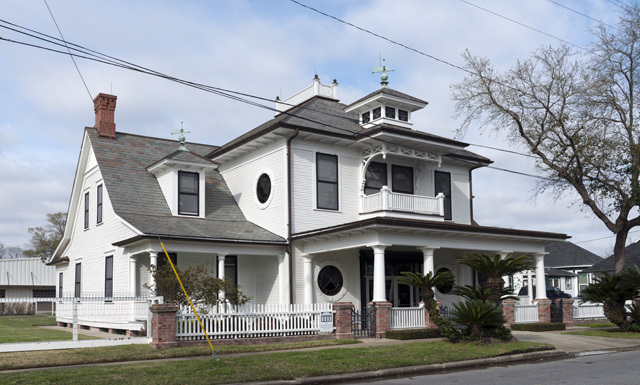 The McFaddin-Ward House, an AAM accredited historic house museum in Beaumont, Texas, is offering a paid summer internship in its collections and education department. 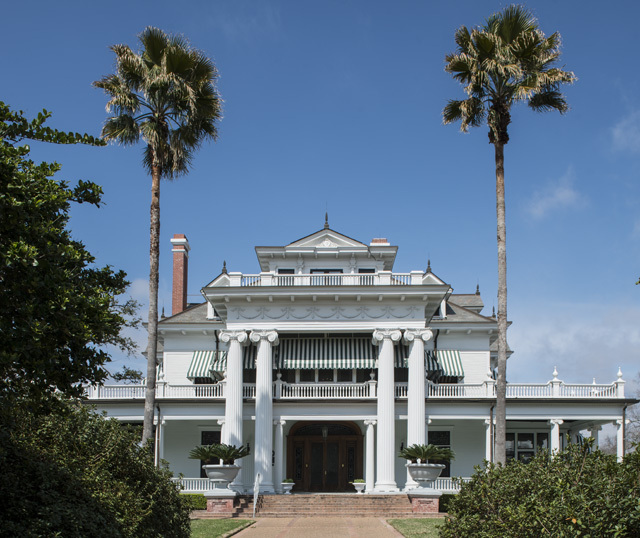 Built 1905-1906, the Beaux-Arts Colonial mansion was the home of Mamie McFaddin Ward, who left it as a historic house museum in 1982. The museum, which opened in 1986, ranges over three city blocks and includes the main house, carriage house, visitor center, administrative office, and collections office building. Position Summary: The intern will gain experience in all areas of a historic house museum and will spend hands-on time in collections, archives, and education. Collections management: Organizing, cataloging and digitizing archives and photographs, collections and interpretation research, data management, storage upgrades for museum collection, object photography, environmental monitoring, and inventory. Interpretation/Education: Working with Summer Camp and junior interpreters, planning onsite and outreach programs, organizing teaching collection. Qualifications: Applicant must have a strong interest in any or all aspects of the museum field, including work in archives, museum collections, interpretation, and education. Ability to do precise and detail-oriented work, knowledge of proper museum artifact handling and computer literacy, and good writing skills are required. A bachelor’s degree, or coursework, training, or equivalent experience in museum studies, museum education, history, art history or art education is preferred. Interns must provide their own housing and their own transportation. Employment Period: Ten (10) weeks at 40 hours per week, with a $2,900 stipend (taxes will be withheld). Flexible work dates between May and September. Office staff is willing to assist with necessary paperwork for interns to obtain course credit. The McFaddin-Ward House doesn’t mess around when it comes to funky ideas for its Lecture Series. The 2017 Season includes programs with subjects ranging from bad art to antique guns. Outreach to those who might never visit a museum is part of the McFaddin-Ward House education strategy. “Many people only think museums are boring. We want them to leave here having a nice dose of art, history, culture, or liturature and not even realize it!” says Lea. 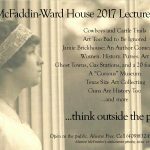 This will be the second year the McFaddin-Ward House has offered its extensive lecture program, one almost every month of the year. The lectures are always free with an occasional reception that follows. If this year’s Lecture Series has a theme, it is probably “how weird can one museum be?” No doubt, you will see some doozies at the McFaddin-Ward House. The Museum of Bad Art Art, for example, boasts a provocative collection called “art so bad it shouldn’t be ignored”. Or how about The Purse Museum? Some will collect anything that appeals to a few who represent almost nobody. At least one lecture is sure to grab your attention this year, so check our website and facebook page often and sign up for our mailings. April 13 – The Purse Museum: Women. History. Purses. Art. Many of us know the story behind the Lucas Gusher at Spindletop, the event that changed the history of Beaumont forever, and pushed the city into the 20th century. But the town of Beaumont was born on the thickly wooded banks of the Neches River nearly a hundred years before that day in January 1901. Join us September 18th, as Rob Blain joins us to talk about his new book Early Beaumont. A native son of Beaumont—educated at both Beaumont High and Lamar University—Blain’s new book is the latest addition to Arcadia Publishing’s popular “Images of America” series. 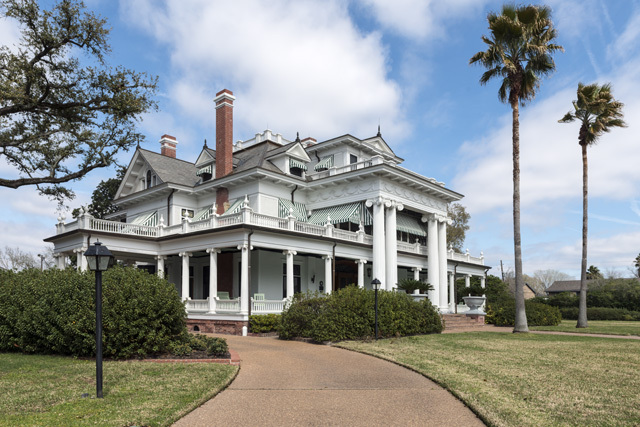 In his talk at the McFaddin-Ward House, Blain will detail the story of those early days in Beaumont, from the settlers at Tevis Bluff, to that infamous oil gusher, on through the second Spindletop in 1925; all events that ushered in a new era in southeast Texas, and the building of a gracious city. As always, this lecture is free and open to the public. Doors open at 6 p.m., and the talk begins at 6:30. A reception will follow, along with an opportunity to buy signed copies of Early Beaumont. Call (409) 832-1906 for more information. Join us for an exciting lecture featuring Perry McFaddin Clark , general manager of Amizetta Vineyards! 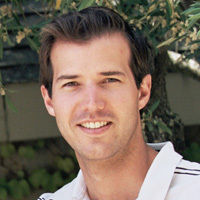 Perry McFaddin Clark earned his undergraduate degree from University of California at Davis in Viticulture and Enology and a MBA from the Graduate School of Management at UC Davis. During college, Perry spent his summers working at Sterling Vineyards and Louis Martini Winery. These internships helped him gain a better understanding of how the “bigger” wineries operated. After completing his degrees, he spent two years working in financial services with Blackstone Funds in New York City. Perry has since taken his wide breath of work experience and focused his attentions back at the family winery as the general manager. Carol Highsmith is on a journey, one that she says will last for most of the rest of her life. The DC-based photographer is taking 16 years to visit every single state in the country (all fifty of them) to take more than 100,000 images of life across the United States of America in the early part of the 21st century. It’s all a part of the This Is America project, which when finished, will donate around 2000 images per state to a permanent collection in the Library of Congress. Each and every picture will be available for use, without any fees or copyrights attached. And the McFaddin-Ward House will be a part of that collection. On Monday, March 3rd, Highsmith stopped by the museum to take pictures. She spent most of the afternoon setting up and taking down, photographing the outside and inside of the house. Those photos will be available on the Library of Congress’s website in about three to four months. Highsmith also wrote about the experience here in Southeast Texas on the blog chronicling the project. Join us for an exciting evening with Meredith Meuwly to learn about Fakes and Forgeries in the art market! Meredith earned her Bachelor’s degree in Classical Studies and Art History from Duke University in 2000, and a Master’s degree in Modern Art, Connoisseurship, and the History of the Art Market from Christie’s Education in New York in 2001. She spent the next five years in the Christie’s New York Antiquities Department as sale coordinator and cataloguer of ancient Greek, Roman, Egyptian, and Near Eastern works of art. During her time at Christie’s, she worked on numerous high profile auctions including the Doris Duke Estate, Ancient Egyptian Art from the Harer Family Trust, and the John W. Kluge Morven Collection of Ancient Art. Meredith joined Heritage Auctions in 2007 as Senior Consignment Director in the Fine & Decorative Arts Department, overseeing two auctions each year. In January 2010, she became the Director of Appraisal Services, preparing formal appraisals for more than 35 specialist categories. In addition to her duties at Heritage, Meredith participates as an appraiser for the Antiques Roadshow on PBS, specializing in Glass, Silver, and Decorative Arts. Meredith is an accredited member of the International Society of Appraisers, serving on the Fine Art committee. She is also a board member of the Foundation for Appraisal Education. Read the full December issue of Viewpoints. In October of 1985, the McFaddin-Ward House was being transformed into a museum. Part of this transformation involved the cleaning of the parlor and breakfast room/conservatory. Museum staff contracted with the Texas Conservation Center, at the Panhandle-Plains Historical Museum, in Canyon, to undertake this project. 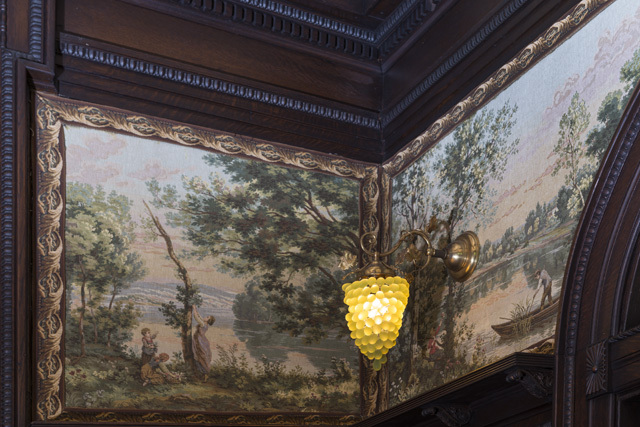 The parlor and breakfast room/conservatory are very unique rooms for many reasons, especially, for their canvas covered, hand decorated walls and ceilings. 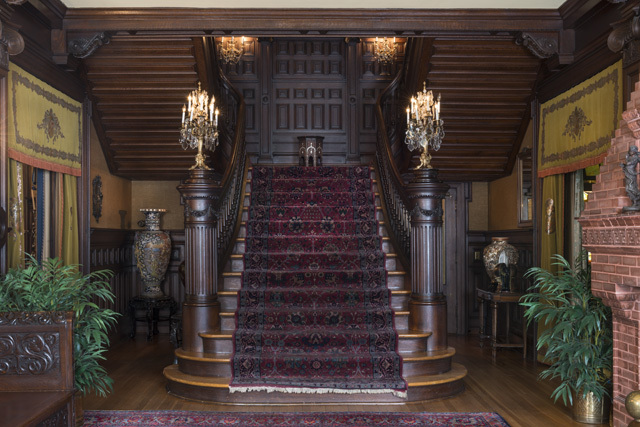 Since early 1907, when the home was first occupied, a layer of grime, caused by pollution from opened windows, cigar and cigarette smoke, and other factors, had slowly accumulated. The staff felt a professional cleaning by trained conservators was necessary. That proved correct. While work on the breakfast room/conservatory went smoothly, work on the parlor did not. As sometimes happens, an unexpected problem can necessitate a unique solution. The parlor presented the staff and conservators with just that. 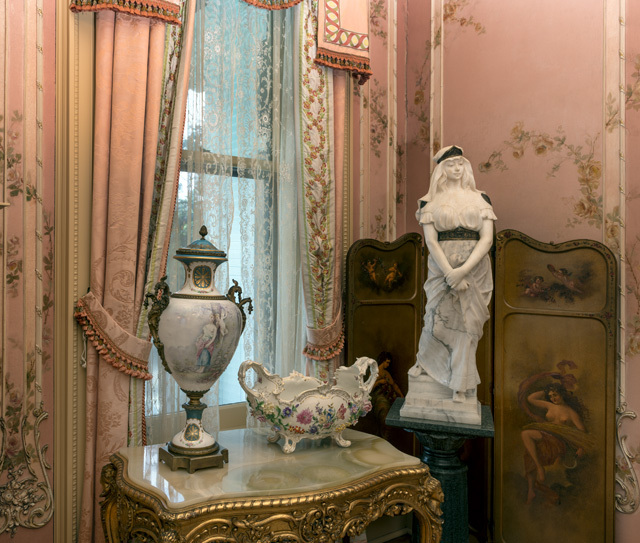 Conservation work on the parlor began on January 5, 1986, and was completed on February 3, 1986. 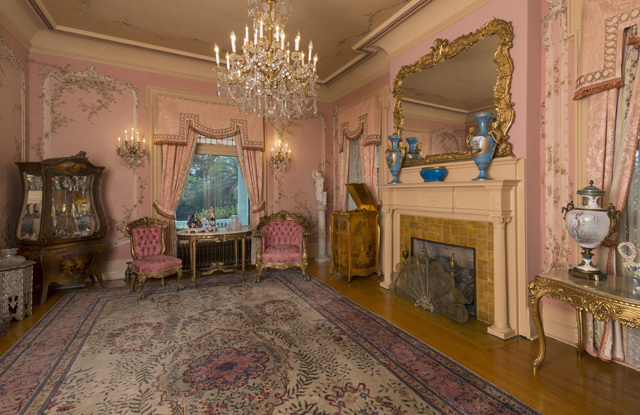 The parlor is comprised of eleven oil on canvas panels of various sizes including a 15×17 single piece for the ceiling. The panels are glued to the plaster walls and ceiling using lead white oil paint as the adhesive. All are painted pink and decorated with a beautiful, hand painted (by an traveling artist) rose vine. A painted, gilt, wooden decoration also enhances the walls. All of this, canvas and wooden decoration, had to be cleaned. The conservators had originally thought the cleaning could be done with a solvent. Everything they tried, however, was too strong and removed paint, or not strong enough, leaving dirt. They, finally, settled on Pink Pearl erasers. That’s right, just like those used in school! This was a technique the head conservator, Tony Rajer, had used before on small paintings, but never on this scale. Doing the work with erasers was going to take much longer than original cleaning estimates and would cost more due to a longer work time and extra help that would be needed. Tony (working with two assistants), immediately, began hiring extra technicians to assist, about fifteen in all. Many were students from Lamar University, who responded to a “help wanted” ad. I was lucky enough to be asked to help and assisted evenings and Saturdays, as did curator Clark Pierce’s girlfriend, “Wiz”. Four scaffolds were erected, erasers were purchased and work began. When Tony exhausted Beaumont’s supply of Pink Pearl erasers, he went to Houston and began buying them there. I do not know how many erasers it took, but quite a few, as one might imagine. Work started around eight in the morning and would, regularly, go until ten or eleven at night. At the end of each workday, the room was cleaned, vacuuming and sweeping up eraser dust that had accumulated. The process involved not only erasing the walls and ceiling, but, also, inpainting with acrylic emulsion paints and watercolor on the wooden decoration, as needed. Some of this decoration had to be re-attached in places with white glue. The consolidation of flaking paint was, also, necessary in some places. This was done with the adhesive BEVA 371. Wrinkles in the canvas were glued down, also using the BEVA 371. When all was completed, the entire surface area was cleaned with a 5% solution of TSP (trisodium phosphate) in water applied with cotton swabs. Finally, a hand applied surface coating of Soluvar Matte varnish was used to protect the cleaned canvas. The work was hard, dirty and tedious, but it was, also, extremely rewarding. Watching as the room came back to life, as it had been in 1907, made it worth the effort. It was a great experience to work with Tony Rajer and the other conservators. They had very positive attitudes and were extremely confident and professional. Tony decided to leave one small area, next to the radiator, un-cleaned to show how dirty the room had been. It is not visible from the tour path. It is necessary to crawl behind the furniture to see it. Whenever I do, I am still amazed at how dirty the room once was, and how beautiful it looks now. Come for a unique chance to see the museum at night at our eggnog evening! Start at the visitor center for tasty treats and eggnog then stroll over to the house for a self-guided tour. The event is free and open to the public. Call 832-1906 for details. See you there! 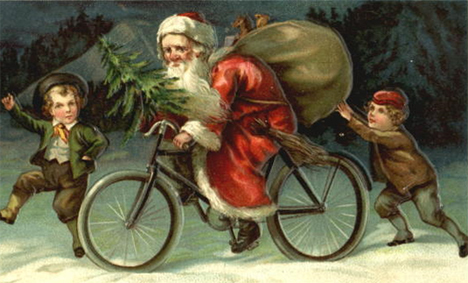 Cyclists: Bring your bikes and join a casual group to ride around town to view Christmas lights, ending at the McFaddin-Ward House Museum for eggnog and a tour. **LIGHTS and HELMETS are required and Christmas lights on your bike are encouraged. The streets are open to normal traffic flow, so please ride with caution and obey all traffic laws (ride at your own risk). 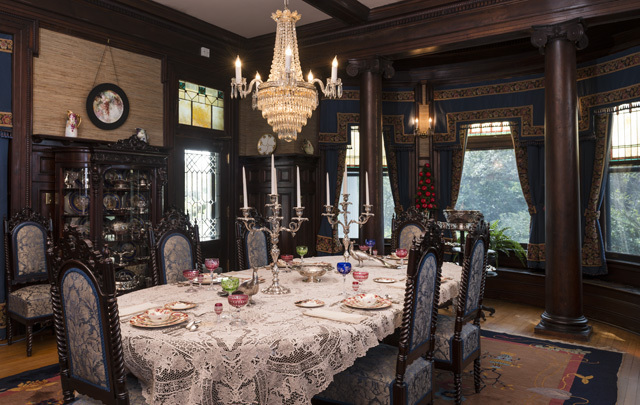 Join us at the McFaddin-Ward House Museum on Saturday, December 14, 2013 from 1-4 p.m., for a celebration of Christmas traditions at the annual Holiday Open House! Take a break from the busy holiday pace and bring the whole family for a chance to enjoy a simpler, more peaceful Christmastime. 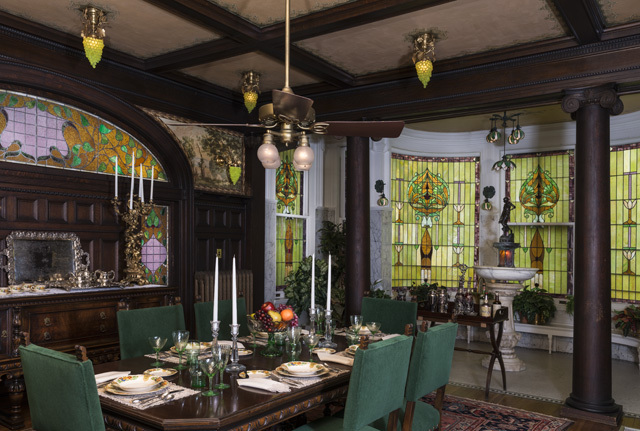 Tour the brightly-decorated first floor of the museum, try your hand at Christmas activities, and sample traditional Christmas cookies and punch while you relax and listen to music of the season. The event is free and open to everyone! Contact us at (409) 832-1906 for more details. Hope to see you there! You are invited to our free family photo day, Sunday, November 10, 2013 from noon to 3 p.m.! Have your photo taken in the museum! One day only! This is your once-a-year chance to dress up and have your family picture taken for holiday cards on the museum’s grand staircase! Bring your own camera, and our museum staff photographer will take the photo for you. All visitors must register in the visitor center at 1906 Calder Ave. the day of the event. Note: No professional photography or spiked heels. Call (409) 832-2134 for more details. The event is free and open to everyone! See you there! Join us for our upcoming conference to learn the basics of conservation, from doing it yourself to hiring the best in the business. 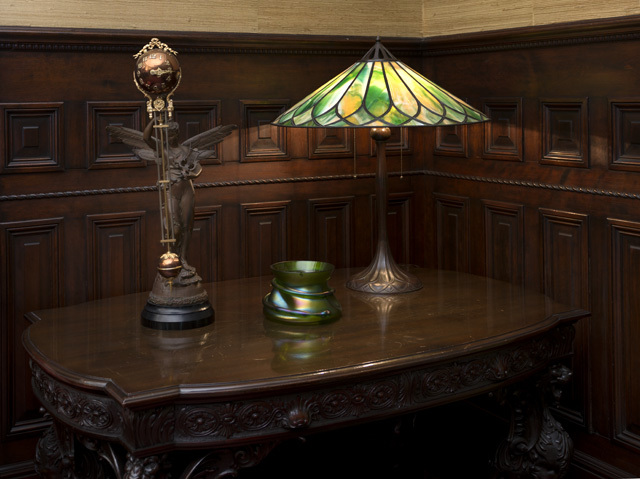 We all have treasured objects in our possession–whether they are personal belongings passed down from loved ones, or priceless museum artifacts. Proper care for these items present many challenges, ranging from a lack of resources to a lack of expertise. Join us at the McFaddin-Ward House 2013 Conference where we will present a panel of experts to address common conservation conundrums to help you ensure that your belongings and artifacts are conserved for the next generation to enjoy. Conservation Savvy: From Expert to DIY has been designed to teach proper techniques for collections care through presentations, site visits, and panel discussions. The event will be held in Beaumont, Texas from November 7-9, 2013. Registration is now open. Please register by November 1, 2013. Register with a credit card online at the links below, or by check by clicking here. The conference takes place at the MCM Elegante Hotel in Beaumont, Texas. The venue is featuring a special $89 rate. Contact the hotel for reservations at (409) 842-3600. 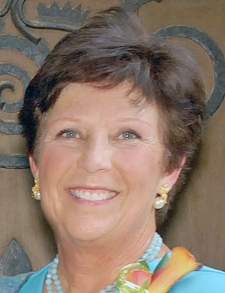 We are pleased to announce Dr. Karen Pope as keynote for Conservation Savvy: From Expert to DIY. Dr. Pope will give insight into the fascinating and important field of conservation with an emphasis on conservation’s value to art history and viability as a career choice. With a PhD in Art History (University of Texas 1981), Dr. Pope is a popular lecturer in and around Austin on diverse topics. With expertise especially in the art of Europe and America in the 19th and 20th centuries, she makes art history accessible and enjoyable for audiences of all levels. Dr. Pope is a full-time member of the Baylor University Art Department faculty, where she teaches art history courses in 19th-century European and American art, the priority of Baylor’s Allbritton Art Institute. So don’t miss Conservation Savvy: From Expert to DIY! Be sure to save the dates, November 7 – 9, 2013 for solutions to your conservation challenges-no matter your budget size! Join us for a free and spooky movie screening of “Bride of Frankenstein”! In this 1935 sequel to Frankenstein, Mary Shelly (played by Elsa Lanchester) reveals that the story didn’t end at the windmill fire. In Bride of Frankenstein, Dr. Pretorius makes a friend for his monster creation. The McFaddin-Ward House movie events are free and open to everyone. Doors open at 6 p.m. and complimentary popcorn and refreshments are served. Dress in your best Frankenstein or Bride of Frankenstein costume to add to the fun! Hope to see you there! Be the first to learn about events.